There are two things that you can always count on when my family gets together to barbecue: my dad’s baked beans and banana pudding. Growing up, that pudding came from a box – cook & serve! My parents capitalized on the child labor available to them for the required (what seemed like) hours of stir, stir, stir. Patience wasn’t really our thing. When I started cooking more things from scratch, banana pudding was one of the few things that I didn’t like better than store-bought. And most from-scratch versions didn’t have anything in the pudding to make it taste like bananas – it was simply vanilla pudding or pastry cream with banana slices. It was good, but not bursting with the flavor, albeit artificial, that made this banana pudding lover happy. Last spring, we made a Peanut Butter Banana Cream Pie for Project Pastry Queen that solved that problem. The pie filling used banana liqueur to convert the ordinary vanilla filling into a real banana cream pie. When I tasted the filling, a light bulb came on. Serve it in a medium trifle bowl or if you’re having a party, use disposable clear 8- or 9-oz plastic cups – people love individual desserts and they don’t get so critical of scoop or slice size, leaving you with half a bowl of pudding at the end of the day. 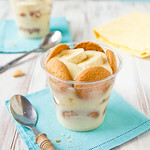 Homemade banana pudding infused with banana liqueur and vanilla bean, layered with fresh banana and vanilla wafer cookies. Place the egg yolks and sugar in the bowl of your mixer and whisk on med-high for 5-7 minutes, until the mixture is a light lemony yellow and mostly smooth. Add the cornstarch, mixing until smooth. Slowly stream in the milk and mix until thoroughly combined. Transfer the mixture to a medium sauce pan over medium heat. Stir constantly, until the custard thickens and coats the back of a spoon, reduce heat and cook another 2 minutes (it might just start to boil). Remove from heat and whisk in the vanilla, vanilla bean scrapings, and the banana liqueur. In a shallow bowl, mix lemon juice with 3 Tbsp water. Slice the bananas into 1/2-inch slices and dip into the lemon water. Shake off excess water and set aside. (This prevents the bananas from browning and lets you make the pudding a day ahead). 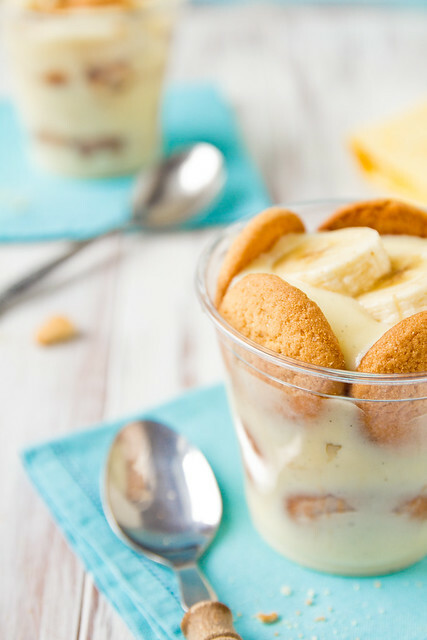 Layer the pudding with vanilla wafer cookies and sliced bananas in a trifle bowl or individual serving cups (will make ~8 9-oz cups). Leave the cookies whole if you're not going to serve it that day - day-old crushed cookies get too mushy. Chill for ~2 hours, until completely cold. Genius! I need some banana flavor in my pudding, too. & now you’ve that bottle of 99 Bananas that has been sitting on our bar a purpose! What a great recipe! Love the addition of Banana Liquer. These are so adorable, Shawnda! I LOVE individual desserts and I know that this pudding is a Texas classic. I’ll have to serve it at my next dinner party. Thanks for the inspiration! I’ve actually…only EVER had pudding from a box. Shame on me! In a major way. I love that liqueur was the answer…that stuff really is magical. I would loooove to try this. Fantastic! Great Father’s Day recipe! So great that it reminds you of family. My dad would love this, too! oh I love banana pudding..just saw this on pinterest! I cannot wait to give it a try. Those look like your homemade nilla wafers. How did you like them in the banana pudding? I have them on my “to try soon” list. My mom always made her banana pudding from scratch, which was my grandmother’s recipe. By the way, have you tried Chick-fil-a’s banana pudding shake? It is pretty yummy!